Home/Posts/Are IGCSEs easier than GCSEs? Update 16:45, 7 January 2019: The table and charts in this post were updated to strictly include figures for regulated IGCSEs, with wording also amended in one place to make this clear. The analysis, and conclusions reached, are unchanged. In the news lull between Christmas and New Year, both the Times and the Observer reported on claims made by the Labour Party that GCSE reforms had favoured pupils in independent schools. This seemed to be based on the assertion that IGCSEs, which are disproportionately used by independent schools, were easier than reformed GCSEs. State schools can enter pupils in some IGCSEs but the qualifications don’t count in school performance tables (league tables, as they are commonly known). In the days when IGCSEs counted in school performance tables, there did not appear to be any particular performance advantage to entering IGCSE rather than GCSE in English language. But is the assertion true now that GCSEs have been reformed? Now that my Quality Street-induced torpor is fading, let’s look at some data. 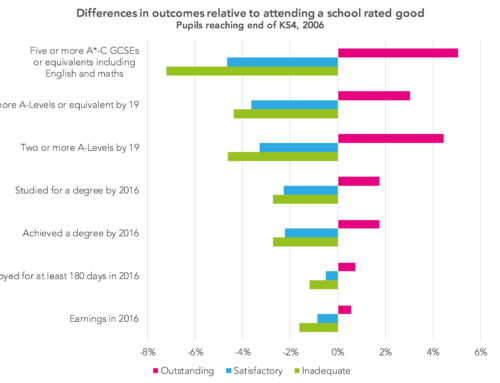 Are IGCSEs graded less severely than GCSEs? To start I’m going to make some assumptions. Firstly, that “easier” means “graded less severely”. This is a topic we’ve covered before. Secondly, that GCSEs and IGCSEs measure the same underlying subject domains. 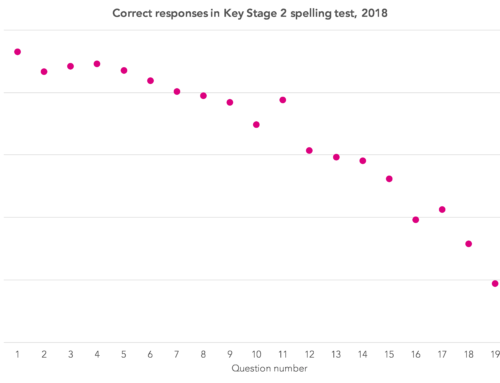 I’m going to look at data from summer 2017, the first year of reformed GCSEs, graded 9-1, in English and maths, looking at all pupils who reached the end of Key Stage 4 that year, including those in independent schools. 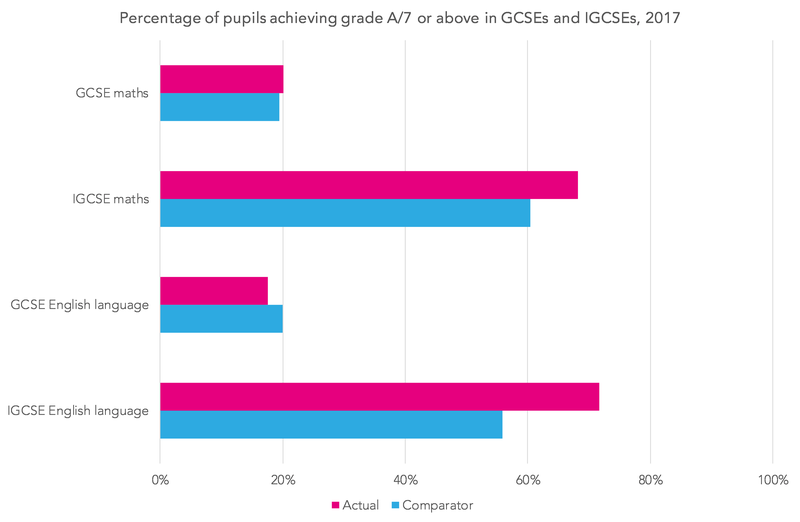 On the surface, attainment in IGCSEs was far higher than in reformed GCSEs. Two-thirds of pupils achieved grade A*-A in IGCSEs in maths and English language, whereas the fraction achieving the equivalent (grades 9-7) in reformed GCSEs was more like one-in-five, as the table below shows. We would expect that to be the case given that the overwhelming majority of entries were in independent schools, where attainment tends to be higher. The question is, would there still be such a disparity in attainment if those who took regulated IGCSEs had taken reformed GCSEs instead? As a rough and ready way of answering this, I’m going to look at pupils’ results in English and maths alongside their results in old style A*-G GCSEs also taken in summer 2017. These cover all other subjects apart from English and maths. Modern foreign language subjects are left aside, as we know that they are graded too severely, as are minority subjects (those with fewer than 5,000 entries nationally). Results in English and maths are then compared to results in these other subjects. Most pupils have several GCSEs in other subjects. In these cases, I randomly pick one. This forms the basis of the comparator bars in the charts below. As the chart below shows, more A*-A grades were awarded in IGCSEs in English language and maths than we might expect given the comparator based on other subjects. The equivalent grades in reformed GCSEs were broadly in line with expectations. 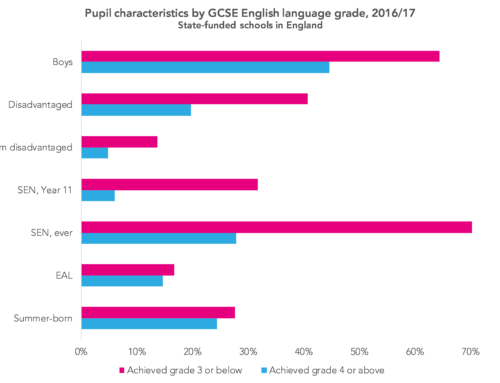 Looking at A*-C grades, slightly more were awarded in both IGCSE and reformed GCSE English language and maths than we might expect given the comparator, as the chart below shows. 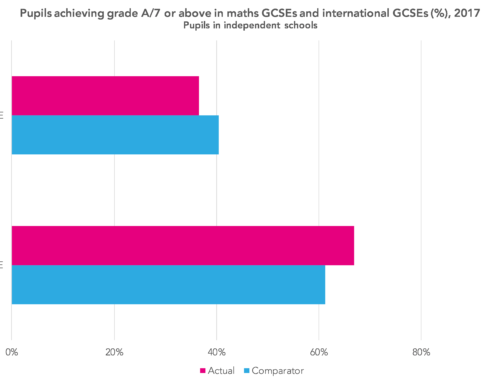 So on the basis of this quick bit of analysis, at the top end of the distribution, perhaps IGCSEs are indeed not graded quite as severely as reformed GCSEs. I’d probably want to do a bit more to ensure the comparators used are equivalent in terms of grading severity but there looks to be something in it. 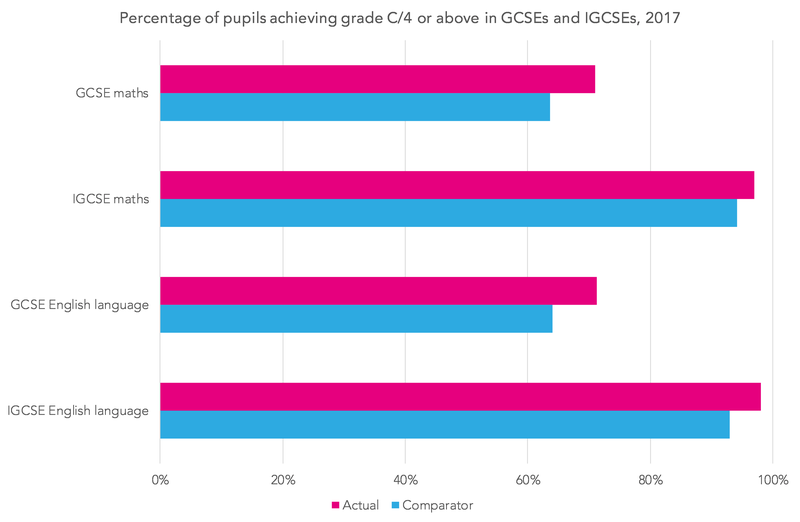 9 January 2019: In response to this post, Cambridge Assessment have published a blogpost on the comparability of GCSEs and their IGCSEs. 1. Those regulated by Ofqual. Really interesting analysis. As you have said “easiness” is difficult to determine. I think there is another element that may be having an impact on future opportunities for students from state schools. The IGCSE in English Literature appears to be much more accessible than the reformed GCSE. In my school, the numbers choosing Lit A-level have plummeted since the introduction of the reformed GCSE. English Lit is a “facilitating” subject for Russell Group universities, providing access to Law, PPE etc. If the more accessible (enjoyable?) IGCSE in Eng Lit means that Independent school students are disproportionately choosing English Literature A-level, then access to degrees that provide a straightforward route into positions of future power and influence is further biased towards the more privileged. Thanks Jonathan. I agree this will be worth looking at when the 2019 A-level data is available. This is a very interesting analysis. I wonder though if there is another aspect to the “easiness”. I am not familiar with all the IGCSE specifications, but certainly with the English and English Literature programmes there is the option for pupils to submit coursework as part of their assessment, which allows them to ‘secure’ a passing grade before they take an exam, as well as reducing the number of exams they must sit overall. It would be interesting to understand any difference in grade outcomes for pupils assessed against the same Assessment Objectives in coursework versus exams, and whether there is any pattern across specifications allowing coursework options versus those assessed solely by terminal exams. Similarly, another aspect of the comparison that occurs to me is whether the grades comparing outcomes from independent schools and those in state schools are all the first attempt grades? Performance tables are based on pupils’ first attempt at each qualification and do not include retake grades which might be better, but is there the same rule for grades reported by independent schools? Thanks for this. I note that you didn’t include MFL as ‘they are graded too severely’. Do you mean too severely for GCSEs, iGCSEs or both. A comparison would still be very useful … I say this as both a headteacher and an MFL teacher. Couldn’t another interpretation just be that E+M are more closely correlated with underlying academic ability than e.g. art, and the IGCSE cohort are higher ability? Very interesting. I wonder whether the top grade effect might also be explained differently, though. Suppose that in schools taking IGCSE (mostly independents) there is a tendency for those students who are capable of getting top grades to be caused to focus their efforts preferentially on English and Maths, whereas in schools taking GCSEs those students are more likely to spread their efforts equally among their subjects. This would happen if, for example, the IGCSE schools are more likely to be focused on % of top grades in English and Maths as metrics (say, while more of the GCSE schools are focused on % good pass). I notice that the school I have most stats for, which takes IGCSEs across the board, does indeed get (slightly) more top grades in English and Maths than in the other IGCSE subjects. I think that such an effect could cause the results you present, even if IGCSEs and GCSEs were identically difficult. How to test which is the right explanation? Well, if, for students taking IGCSE Maths and English, you plot as a comparator a randomly chosen IGCSE, not GCSE, subject, then what happens? If my suggestion is correct, we would expect the comparator subject still to show a slightly lower proportion of top grades. If it’s that IGCSEs are systematically easier, we’d expect the difference in bar lengths to disappear. Interesting article – an argument that has been doing the rounds for a little while now. I wonder if it is possible that the way in which this has been reported (The Times, Sat 5 Jan 2019) may have served to fan the flames of the ‘harder v easier’ debate. Having experience of teaching IGCSE English at FE college – not one of the top independent private schools by any stretch of the imagination – my feeling is that the tasks set for this are perhaps more accessible (not easier) to our post-16 students than the reformed GCSEs are. They have to show understanding in comprehension, directed writing, summarising, descriptive or narrative writing. These are skills that they use and will need in a (dare I say it?) ‘functional’ life outside of college.